Staggering global payments imbalances are a defining feature of contemporary capitalism. From the 1980s, with the emergence of the ‘neoliberal’ phase of capitalism, two major categories of growth model have emerged: debt-led growth models, marked by current-account deficits, and export-led growth models, marked by current-account surpluses. These two contrasting models are interdependent: those running deficits provide the consumption that balances the surpluses of export-led countries. Both have emerged in response to a broader trend of stagnating domestic demand linked to greater inequality and a declining wage-share of national income. These dynamics are features of a general hollowing out of the redistributive compromise between capital and labour upon which post-war social democracy was founded – what Wolfgang Streeck has referred to as a crisis of ‘democratic capitalism’. Within the debt-led model, the US and the UK have been the key cases. The crisis raised inevitable questions over the sustainability of the debt-led growth model, exposing in particular its reliance upon a specific low interest rate-low inflation equilibrium. So how have the Anglo-American economies responded to the apparent weakness in their growth models during the recovery? One way into this question is to examine the current account deficits of the US and UK in order to identify clues as to whether either country has managed to address the flaws of their pre-crisis orientation. What is the current account? It essentially measures the ability of a country to pay its way in the global economy. When the differences between imports and exports, national earnings on foreign investments and foreign earnings on national investments, and international transfers to and from a country are added together, we are left with the overall balance. This gives us an overall picture of whether that country is lending overseas (by running a surplus) or borrowing from abroad (by running a deficit). If it’s the latter, namely, a current-account deficit, then the country relies upon inflows of foreign capital to cover that deficit, either through the purchase of assets or provision of loans. The Anglo-American economies have run chronic current-account deficits in recent decades. For the UK, this reflects the long-term decline of manufacturing competitiveness, as well as the impact of an overvalued pound during many decades after World War II. For the US, the current-account deficit represents a decline in competitiveness, but also its huge (and ongoing) military expenditure overseas and its need to provide global liquidity as the world’s key currency country, a problem famously identified by Robert Triffin. This long-term trend continued in the years before the crisis, with the US current-account deficit reaching its highest ever level, at 6% of GDP, in 2006. In the crudest terms, the US and the UK have been living beyond their means: consuming more imports than they can cover with exports as their trade competitiveness, in the aggregate (and particularly in manufacturing), has waned under challenges from other economies. This matters. In contemporary society, consumption is crucial to legitimating capitalism. This importance has grown as confidence in democracy and the redistributive role of the state have corroded. A steady stream of affordable imports, from foreign foodstuffs to Ipads and Nike trainers, are central to this consumerist vision of life. In Anglo-America, running deficits and building up debt enables the maintenance of these standards. The point here is that continuing current-account deficits jeopardise the inflow of these goods, via currency crises and inflation as the national currency weakens under speculative attack. This was the story of the repeated sterling crises that blighted post-war British capitalism. In an era of financial liberalisation and globalisation, defined by capital mobility and floating exchange rates, the current-account deficit has been sustainable for longer. There are, however, limits. In the longer term, the failure of key countries to arrest their current-account deficits will likely lead to currency pressures and the need for painful adjustment by reducing domestic consumption and boosting exports. More austerity would be the likely remedy. Measuring the breathing space of a current-account deficit is tricky: it ultimately rests upon the subjective market perceptions of foreign investors as to the desirability of the deficit country’s assets and its overall creditworthiness. This has lately not been a problem for the US and the UK. Both countries experienced sustained levels of high growth and low inflation (and therefore good returns for foreign investors) in the pre-crisis years. And both economies have experienced a sufficiently strong rebound of growth (relative at least to other Western economies) during the recovery. This has enabled the two countries to continue living beyond their means: over-consuming foreign goods and maintaining high consumption patterns. What’s more, the limits for the US and the UK are by no means wholly comparable. The US is the largest economy and the most powerful state in the world. It has a strong internal basis for growth. Crucially, it issues the global currency: the dollar. Despite the emergence of currency rivals since the crisis, such as China’s renminbi, foreign demand for dollar safe-haven assets has remained remarkably high. The story for the UK is different. Sterling is not comparably indispensable to foreign investors. A contraction in UK demand for foreign goods has nothing like the same magnitude of effect as a slow-down in US domestic demand. Arguably, then, it is the UK that most urgently needs to address its current-account deficit. And yet, as the graph below shows, the two economies have diverged significantly in terms of their deficits in recent years. It can quickly be seen that the US current account deficit has improved overall. It’s in much better shape than it was pre-crisis. This is largely down to the unexpected benefits of the shale-gas revolution, which has led to cheaper energy costs, benefitting export competitiveness and reducing oil imports. 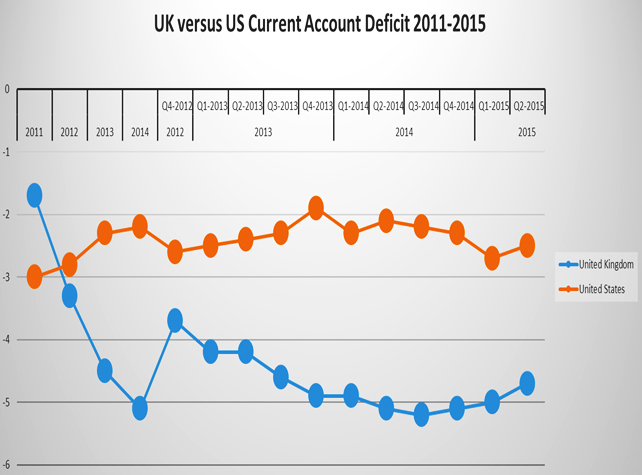 The UK, by contrast, has experienced a major worsening of its current-account deficit. It reached a record high of over 5% of GDP in 2014. What this suggests is that, on this indicator of macro-economic sustainability, the recovery has involved a significant divergence between the two major Anglo-American debt-led growth regimes. Consequently, it is the sustainability of the UK recovery which looks much more fragile. In the UK the deteriorating current account has not been caused by declining trade competitiveness, which has been dreadful for a long time, but rather the reduction in returns on overseas investment. The arbitrage machine, whereby the UK borrows cheap and then invests at a higher return, appears to have broken down. If this development has staying power, then the UK economy may be in serious trouble. That perception only grows when we contemplate the looming threat of ‘Brexit’ to the UK economy. Running a current-account deficit of the UK’s magnitude requires a steady inflow of compensating capital flows. But, if events disrupt this by shaking confidence in UK assets and growth prospects, those flows can dry up, and quickly. ‘Brexit’ is a prime candidate to be such a trigger event. Any improvement to the UK balance of trade, to compensate for declining investment income and inward capital flows, would unquestionably involve painful adjustment. In the past, the Bank of England has raised interest rates to draw foreign investors back into UK assets and choke off domestic demand for imports. But, with a recovery premised on further increases in household debt and the new zero-bound interest rate era (which has offered monetary looseness to compensate for fiscal austerity), that lever is an extremely risky one to pull. It could wreak havoc with the solvency of British borrowers and shatter domestic demand. The alternative, which would be to hope for rebalancing through allowing a massive depreciation in sterling, would have equally unpalatable consequences: consumer price inflation and a major hit to British living standards. As we know, predictions of a turbulent year ahead for the global economy are growing in volume. Within the Anglo-American debt-led economies, the UK’s position looks particularly precarious. The ‘delayed crisis’ of democratic capitalism may not be delayed in the UK for too much longer.